The 2017 AHIMA Convention & Exhibit was as timely as ever – and not just because the California sun was a welcome relief from rainy DC. The industry-wide problem of patient matching has been getting more and more attention in the press recently and was top-of-mind for many in LA. Three days before the convention, five US senators wrote a letter to the Government Accountability Office (GAO) urging it “to consider how ONC could improve patient matching by considering the application of a national patient matching strategy.” And on the third day of the convention, HIMSS released a “Call to Action for Interoperability” to the industry requesting, among other things, to standardize identity management approaches. Patient matching was a hot topic in the walls of the LA Convention Center just as it was outside of them. Lorraine Fernandes, president-elect for the International Federation of Health Information Management Associations (IFHIMA) and co-author of the recent AHIMA article, Applying Innovation to the Patient Identification Challenge, held two widely-attended sessions on patient matching. The first, “Winning the Match Game: Strategies for Patient Identity Matching” illuminated how people both in the US and abroad struggle managing this issue – often throwing more people at the problem, or attempting to rule data through governance measures. The second, “Innovation is Being Applied to the Patient Identification Challenge”, included our customer Healthix and provided insight into solutions many were seeking in the halls. Tom Check, CEO and President of Healthix, made a strong case on how vast amounts of claims and clinical data – coupled with a diverse population and lack of control over data governance – creates some of the toughest patient matching challenges in the country. 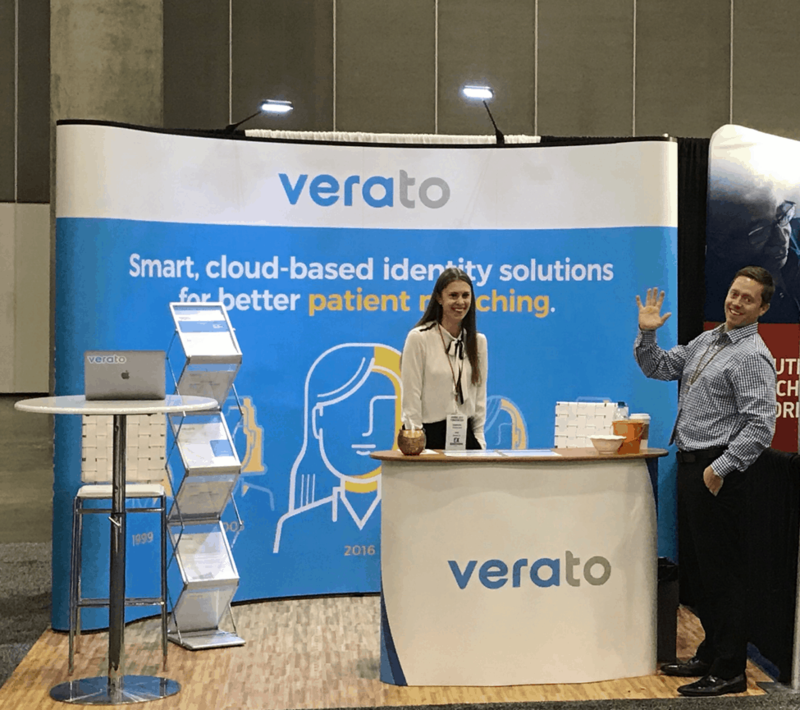 Tom reviewed how Verato Referential Matching technology helped Healthix dramatically reduce their duplicate patient record rate, even as their data ingestions increased. As an HIE, Healthix has a high bar to deliver timely and accurate data. Referential Matching was a needed technology. Healthix used Verato Auto-Steward™ to automatically resolve 100,000 “potential duplicate record” tasks per day that were being flagged by Healthix’s EMPI. It is always exciting to see head-nodding when people learn about Referential Matching technology. As the industry searches for answers, it’s nice to see those learning the answer may be in front of them – and how Referential Matching technology could be the silver bullet for patient matching challenges.